SEO means many things to many people. In actuality, it’s a broader concept designed to increase authority on particular subjects and popularity among peers to increase the odds of being properly classified. It can get incredibly complex and time consuming on a large scale. However, it doesn’t always have to. Instead, you might be able to see awesome results by simply focusing on a few key areas; constructing a fulcrum for leverage rather than chasing your tail with the latest ‘tricks’ or ‘hacks’. But first, you need to understand where this thing is heading. So too, does content. (Specifically, its accessibility + topic targeting + quality). But in the last few years, a third factor has risen to become one of the most influential methods that determine exactly where you show up in a search result: RankBrain. Chances are, you (mostly) know all about the first two. They’ve been talked about ad nauseum for years. The third is a more recent development that employs machine learning to consider a mind-numbingly complex amount of data within half a second from receiving a search query. RankBrain’s success lies in its low level artificial intelligence, able to not only process stuff quickly, but also more increasingly accurate over time as it grows, matures, and adapts. Couple this development with the increasingly personalized search results different users see, Google’s push into ‘instant answers’, the continued layout tweaks of search engine result pages that alter what (and where) stuff shows up, and you’ve got your work cut out for you. This doesn’t even bring up the larger algorithm updates, or the smaller on-going tweaks to existing ones happen routinely to continually refine their approach. All of this stuff to ensure that they get better at filtering the good from the bad. That means hopefully, one day soon, you won’t see the same unfortunately obvious junk polluting the prime 1-3 positions while you toil away in obscurity doing ‘the right thing’. It also means that if you strategize properly, you should be able to identify a few crucial areas that if executed properly should snowball enough to deliver the elusive marketing flywheel. Here are a few of those areas to scrutinize. 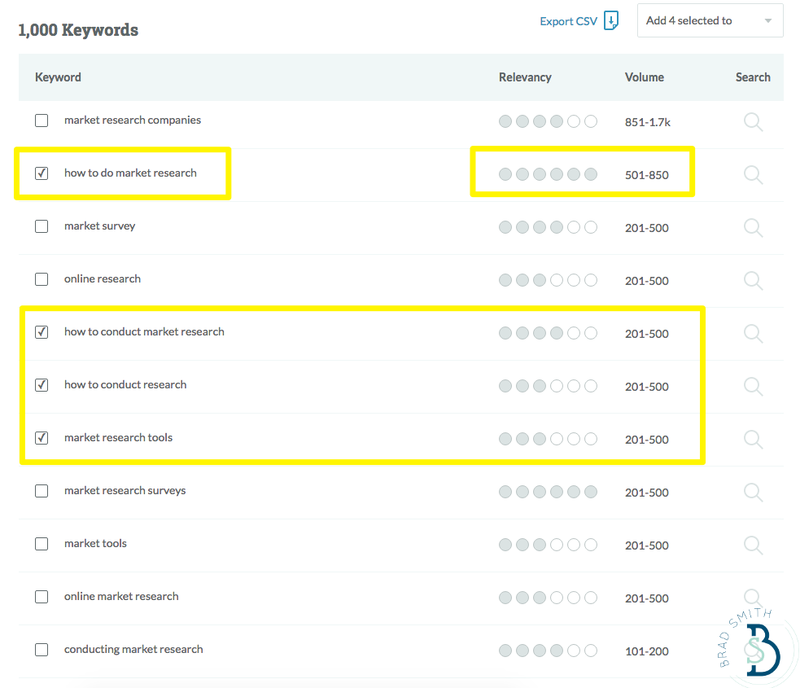 Traditional keyword strategies are broken. They’re still incredibly important, no doubt. But not in a 2005 kinda way. Instead of blindly looking for all things related to the phrase you typed in, they attempt to understand or interpret the meaning behind the words used. That extends to words on a page. Sure, inserting a keyphrase X times in Y locations can help. But more importantly, is the context of topics and information around those keyphrases. That means keyword research, or the process of identifying topics related to your site’s pages, requires a hell of a lot more nuance than simply selecting stuff based on (inaccurate) volume estimates. 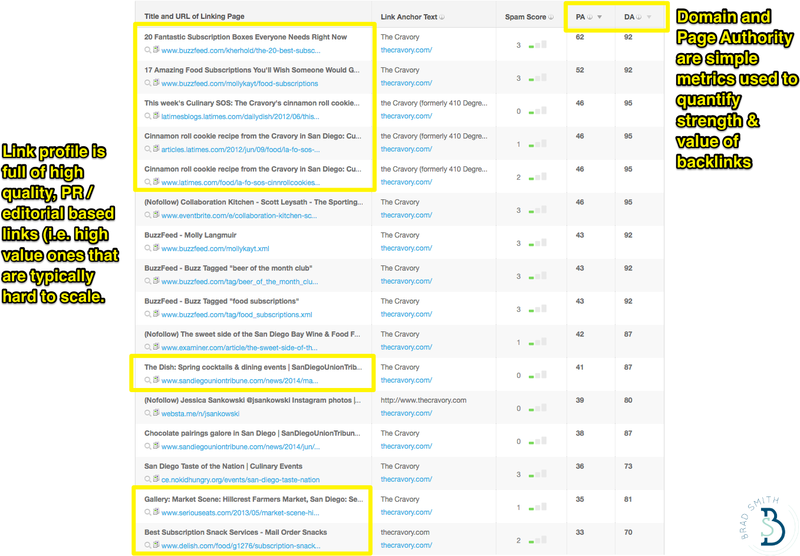 Ross from Siege Media laid out one incredibly thorough keyword analysis in this excellent post. Simply put: it’s awesome. Yes. My brain hurts after reading that too. If you’ve got the time and resources, follow that. Moz recently released a new Keyword Explorer tool that brings in several critical factors to analyze. Volume: An upgraded search volume estimate. Difficulty: A rough range of how competitive ranking on a specific page might be. Opportunity: The odds of click-through-rate based on how the SERP layout looks. Potential: An aggregate score to easily compare like-keywords by. As you can see, it’ll also pull in the top pages already currently ranking for that query so you can dive into details on the competition. The toll will also help you pull up related or similar phrases, which you can then sort by relevancy and volume (and add to a custom list for further review). Historically, you either didn’t have access to some of this information, or you had to take the scenic route by manually researching and crunching numbers. So what used to take days-to-weeks now takes maybe an hour – without sacrificing the additional nuance you need to successfully choose keywords in today’s dynamic search environment. There’s a Catch-22 that many websites don’t even realize they’re struggling with. 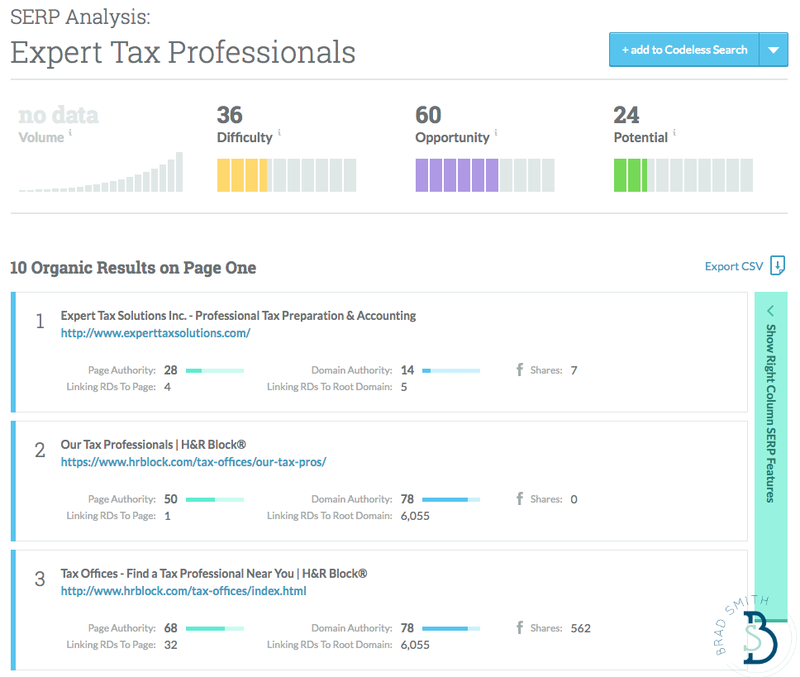 They want to rank for a ‘commercial’ keyphrase like: “tax relief”. Yet 99.9% of the pages on their website are branded. How you gonna rank for that topic when information related to that appears on 0.01% of your website? In the good old days of dumb algorithms, you simply force-fed primary pages like your Home page with said keyphrase, attempting foie gras but resulting in an incoherent mess that looked and talked and walked like spam. I wish that was the only problem, but it’s not. The other is ‘thin content’. So the pages that DO contain information related to this stuff, only have ~200 words on them. Because they’re going for ‘creative’ or ‘branding’ or whatever. That’s an issue, as the content ranking on an average first-page result has around 1,890 words per page. Despite how trendy-hipster it sounds, content marketing. Creating new skyscrapers can be incredibly time consuming. Instead, let’s start with what you’ve already got, repurpose some existing stuff, and upgrade it. First, go back to the basics. What drives your customer’s purchasing occasion? What’s the problem or pain points, and how do you uniquely solve those? Good. Those just became your themes, angles and blog categories. Next up, pull up the aforementioned keyword tool to do some opportunistic research. The goal is to pre-identify specific topics that are already sitting there for you to capitalize on. That way you’re not shooting in the dark, or crossing your fingers next time you hit Publish. 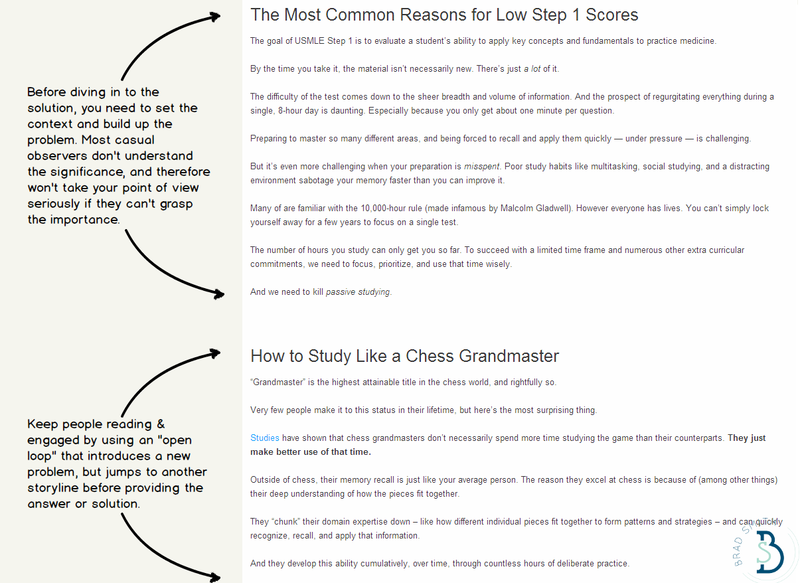 Blog posts commonly fail because they dive straight into the solution. Or the tips. Or the process. So you’re left with ~250 words. And you’re not giving new readers (or the peeps you’re trying to appeal to with blog posts) the chance to (a) recognize the same issue in their life and (b) develop the empathy or interest required to actually read the damn thing. The old copywriting PAS formula can help. Problem: Identify the root issue or pain point that’s driving people to start searching for education, information, products, or services. Agitate: Discuss the various ways this issue manifests in someone’s daily life with concrete examples. Solution: Only when you’ve properly outlined the issues can you solve them. The old storytelling formula should apply to a blog post as it does to a movie or television show. You build the foundation, introduce conflict, built tension, climax and release (get your mind out of the gutter). Pulling from source material (like offline speeches or presentation, case studies with clients, testimonials from customers, industry research, proprietary studies, etc. etc. ), you should be able to now go in and ‘fatten up’ your page content while also changing the focus from your company to your customer’s problems. New content creation is good and important. But stop being a slave to artificial deadlines (like we have to publish X times per week) and start with simply improving your existing stuff first to see a quicker lift. Link building can be an incredibly frustrating, often fruitless effort. Especially when you consider today’s minefield that is Google’s algorithm updates. So… just piggyback on your marketing campaigns. Because the best link building results often come from larger campaigns or promotions leading the way. You can see evidence of this when you review a few link profiles of established companies. Pull up any backlink-checking tool and sort by highest Domain authority or rating (to judge the aggregate strength or value of that link). For example, this one from an online + brick and mortar retailer features a bunch of reviews and editorials covering their recipes and events. Those links are high quality. And hard to get. You can’t fake ‘em. Or swap ‘em with some anonymous tricksters in a forum. Which means they’re valuable and highly desired. Or how about this one from the Hard Rock Hotel in San Diego, highlighting Cyber Mondays deals from a specific promotion. Point is, both link profiles feature links that are the result of larger promotional efforts and campaigns. NOT from classic ‘link building’ like emailing a million site owners about their 404 errors and hitting them up for links. These links also have the added bonus of showing up in places that actual customers might actually search too. Let’s stick with local businesses as an example. Say you’re going to throw an upcoming event at your location. Or you’re going to put together a promotion for the upcoming holidays. 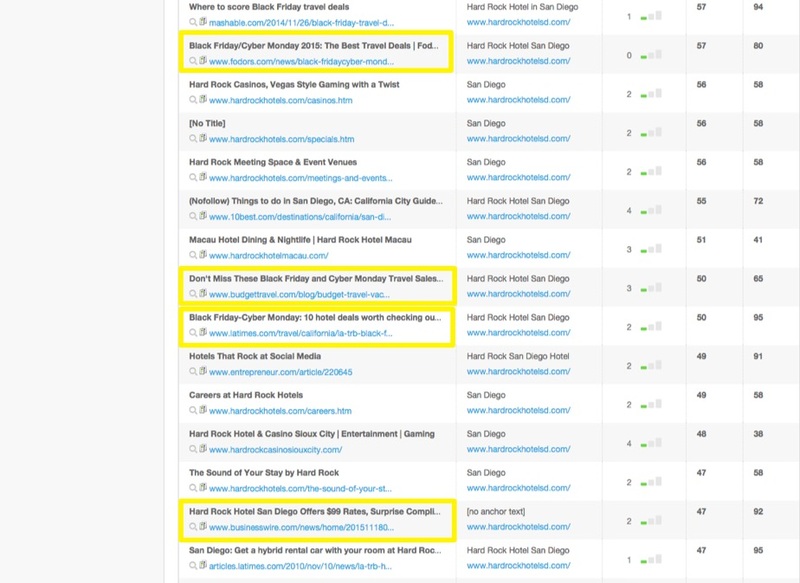 Now with one campaign, you’ve got multiple link building opportunities. Publish a new page on your site with details about the event/promotion/campaign, and set-up multiple CTA’s across your website directing people back to it. Hit up the low-hanging-fruit of your own email lists and social accounts. Incentivize them to leave reviews on local listings. These will not only help where you show up in results, but are also trusted as much as personal recommendations by 88%. [your thing] or promoted this stuff in the past. This gives you a ‘warm’ audience to reach out to, because they’ve already expressed some interest previously. Craft unique pitches to the journalists, emphasizing how this campaign fits directly into their point of view and would be immensely helpful to their readers. Find and invite the best local bloggers to participate somehow. Some kind of exclusive access to an event works, otherwise a special discount for their readers or even a revenue share agreement for everything sold through their site might pique their interest. Set-up specific ads or deals related to your campaign to increase visibility on local listing sites like Yelp or TripAdvisor (which are the first places people go when beginning to evaluate their alternatives – before they know you by name). Create retargeting ads, targeting anyone who visits your site (or this page) during this promotional push to capture or bring back as many people as possible (which includes a healthy mix of interested potential prospects, journalists you’re wooing, bloggers you’re pitching, and loyal customers who’re on the verge of re-purchasing or referring you to their friends). Companies always want to rank #1 for the term [fill in the blank]. But… do you deserve to? Despite the fact that this over-prioritization of rankings is dying out, at the end of the day search results are designed to filter and surface the best stuff out there. No amount of magic fairy dust or blackhat tricks some ‘SEO’ dude says will change that. Search rankings are a lagging indicator. You provide awesome service, build an awesome product, get written up in the press and have customers spread the good word, and then you rank. The good news is that SEO also doesn’t have to be time consuming. It’s just an extension of what you should already be doing, and paying special attention to a few small areas that deliver outsized results.